Evidence-based nutrition education where you learn simple techniques to cook tasty and healthy meals for the whole family. Food as Medicine Everyday (FAME) is a 12-week program offering nutrition education classes on a variety of topics to help improve diet and lifestyle. You’ll learn simple techniques to cook tasty, nutritious meals. Introduction to Nutrients: Fats, Carbohydrates, Proteins, Vitamins & Minerals. Each participant will receive a copy of Food as Medicine Everyday: Reclaim Your Health with Whole Foods. Saint Luke’s Muriel I. Kauffman Women’s Heart Center is a founding member of the Food as Medicine Institute Alliance. Visit the Food as Medicine Institute for more information. For more information and to register, call 816-932-5784. Classes are every Tuesday from 6:00 – 7:30 p.m. in the Women’s Heart Center conference room at Saint Luke’s Hospital. Available until two weeks before the series begins. “As a trained Family Nurse Practitioner, I entered this course with a high level of nutrition and health knowledge. The FAME course has succeeded in adding to my knowledge base as well as allowing for an opportunity to apply this education during the hands-on cooking segment. I learned new cooking techniques, recipes and explored new and delicious food choices. This course has exceeded my expectations as I have actually incorporated these new recipes and foods into my family’s diet and look forward to sharing what I’ve learned with my family, friends and the community that I serve in." “Over the last two years we have decided we have to be advocates for our health at a greater level than we had done in the past. We had experienced difficulty resolving several medical issues over the past few years, and we have changed all of our medical providers. When we learned about the FAME program, we felt this would be an important piece to understand and integrate into our increased advocacy. The program and information has provided us with a renewed prospective on nutrition. We had grown up in families that cooked traditional meals with the limited understanding of nutrition (available at the time). The FAME classes have brought a new prospective to our health and nutrition. It is comprehensive and allows hands-on experience preparing nutritional foods, understanding the real facts about nutrition, and preparation of foods. The class is a good mix between lecture opportunity and preparation. Additionally any questions that arise are answered. We hope this new understanding of nutrition will allow us to have many years of informed nutrition to support our health! We recommend FAME to anyone interested in continuing and improving their nutritional health!" 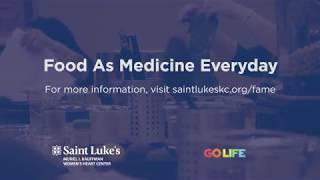 Lucas Schubert, Nutritional Coordinator with Saint Luke's Mid America Heart Institute and the Food As Medicine Everyday (FAME) program, shares an easy way to make healthier choices by reading food labels with FOX4 morning show. You can use food everyday to help heal your body. The FAME program teaches you just that - how to take care of your body, improve diet and lifestyle. Lucas Schubert, Saint Luke's Nutritional Coordinator at Saint Luke’s Muriel I. Kauffman Women’s Heart Center, shares a great Rainbow Quinoa Salad while on FOX4 morning show.